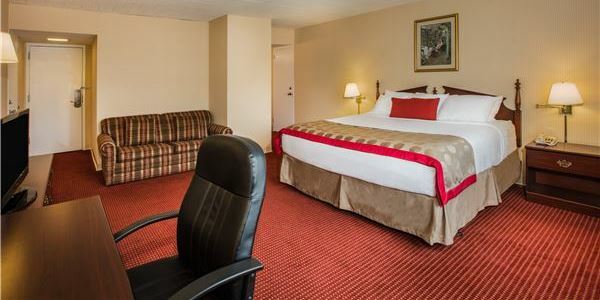 Relax, work, and enjoy your stay in one of our contemporary-styled guest rooms or spacious one-bedrooms suites at Ramada Ligonier. 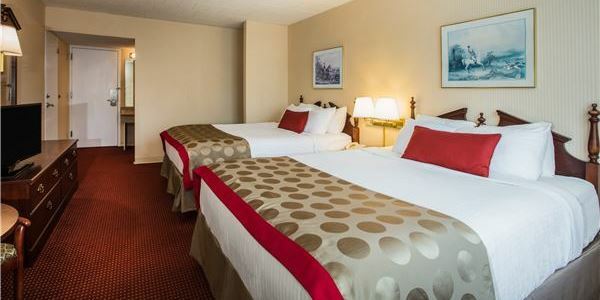 All of our accommodations feature comfortable king or queen beds, mini refrigerators, flat screen TV's, and modern travel amenities that make your vacation or business stay easy. Sleep comfortably in plush beds with triple sheeting, stay connected with free WiFi, and enjoy a complimentary hot breakfast daily. 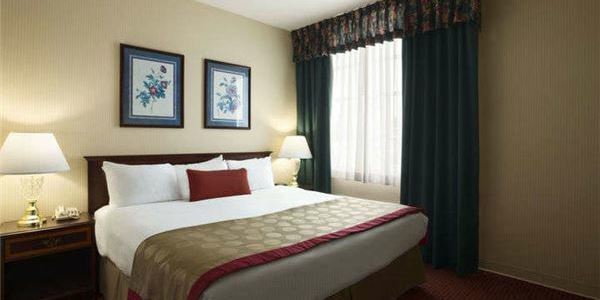 Relax in this spacious room with one king bed with triple-sheet bedding. Appealing extras include a sleeper sofa, cable television, refrigerator, free Wi-Fi, in-room safe, work desk, voice mail and hair dryer. 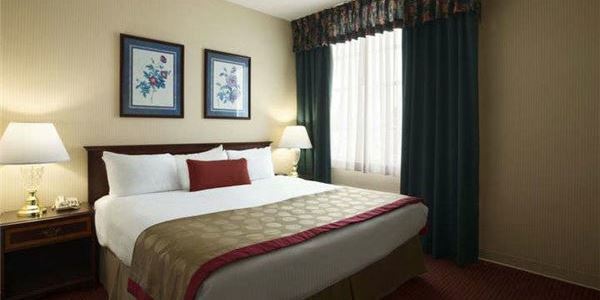 Spread out in this comfortable room with two queen beds with triple-sheet bedding. 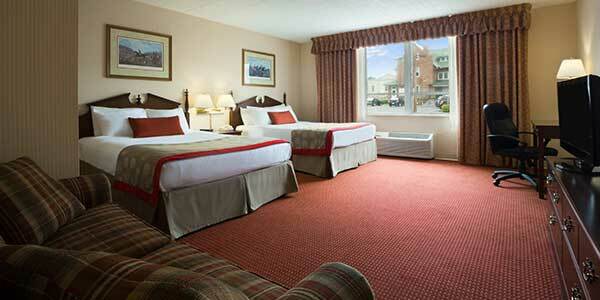 Amenities include a sleeper sofa, cable TV, refrigerator, Wi-Fi, in-room safe, work desk, voice mail, and hair dryer. This classic guest room features two queen beds with triple-sheet bedding. Guest conveniences include cable TV, free Wi-Fi, refrigerator, coffee maker, hair dryer, small table & seating, voice mail, in-room safe, and blackout drapes. 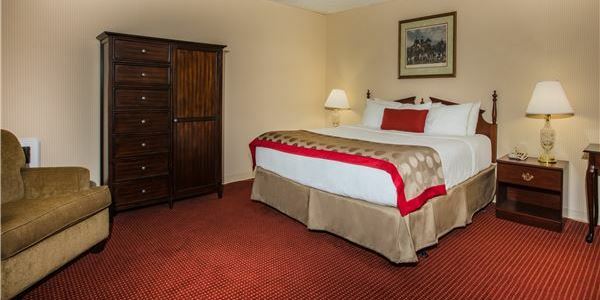 Relax in this cozy guest room with one queen bed and triple-sheet bedding. Enjoy thoughtful amenities, like free Wi-Fi, refrigerator, coffee maker, in-room safe, work desk, voice mail, blackout drapes, and hair dryer. Celebrate your honeymoon or romantic retreat in our Bridal Suite. Premium features include a king bed with triple-sheet bedding, marble tile bathroom, Jacuzzi tub, living room area, refrigerator, and microwave. 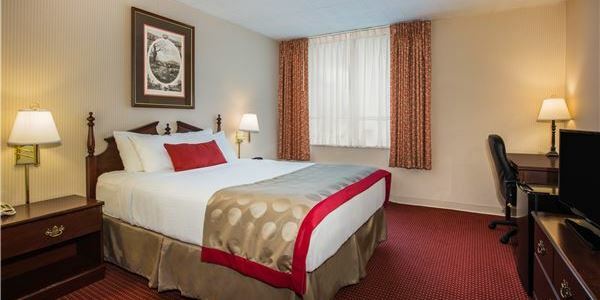 Indulge in our one-bedroom Junior Suite with a king size bed with triple-sheet bedding. Amenities include a mini-kitchen with refrigerator, microwave and toaster, living room, sleeper sofa, and whirlpool tub. Feel at home in this handicapped accessible room with one king bed with triple sheet bedding, oversized bathroom with handrails, shower/bathtub combo with handrails and adjustable handheld shower head, and lowered sink. 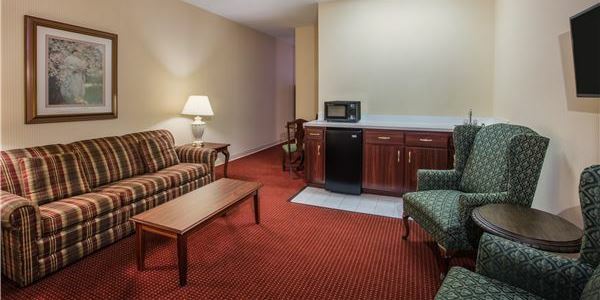 Amenities include a recliner chair, coffee maker, in-room safe, refrigerator, and work desk. Shower chair and raised toilet seat with grab bars are available upon request. This handicap accessible room offers one queen bed with triple sheet bedding, bathroom with handrails, and a shower/bathtub. Amenities include coffee maker, in-room safe, refrigerator, and work desk. Shower chair and raised toilet seat with grab bars are available upon request.